The Stripe Add-on WordPress plugin for Cab Grid Pro offers an alternative means of processing payments to the built in Paypal functionality. A free Stripe account is required to use this add-on. Additional sources can be selected via the Stripe Add-on admin panel. 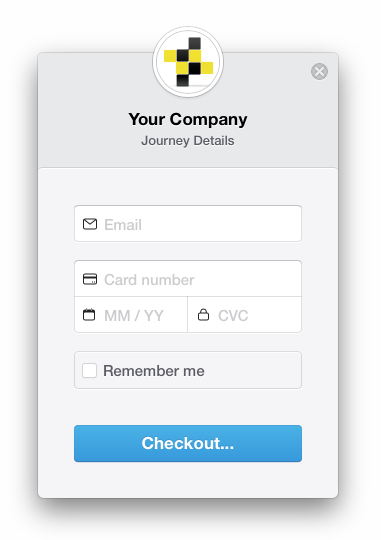 When any source is selected in addition to the standard credit or debit card payment type, the Stripe checkout will appear inline (rather than as a pop-up). This will also limit some of the options (icon, title, label) in the admin panel as they are not relevant to the inline checkout. Using any additional sources requires your website provide an secure (HTTPS) connection to your customers. 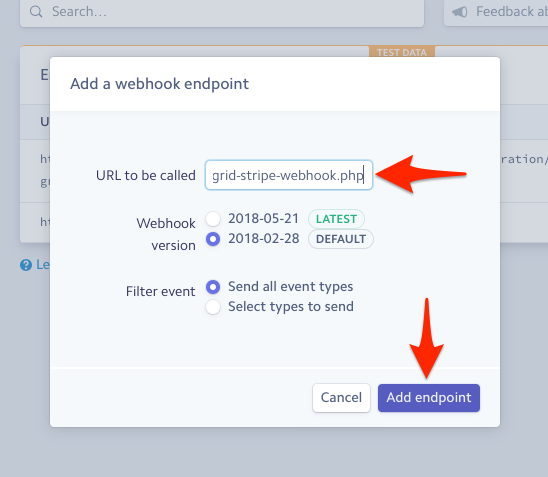 Using additional sources requires a WebHook URL to be added to the Stripe Admin. 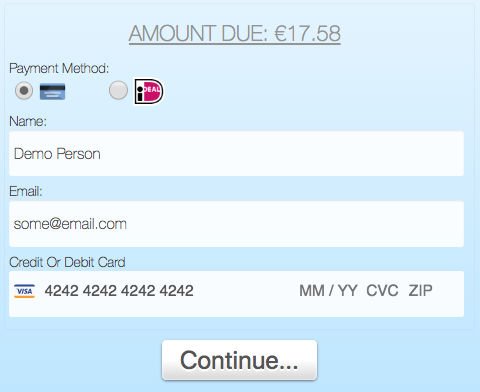 In order to complete a transactions using some payment types (GiroPay, iDEAL, Sofort) Stripe sends information back to your website behind the scenes. Only when this information is processed is a transaction considered complete. For example, if the Cab Grid Booking Management Add-on is installed and activated, the webhook sets the booking to paid. Log in to Stripe Admin. 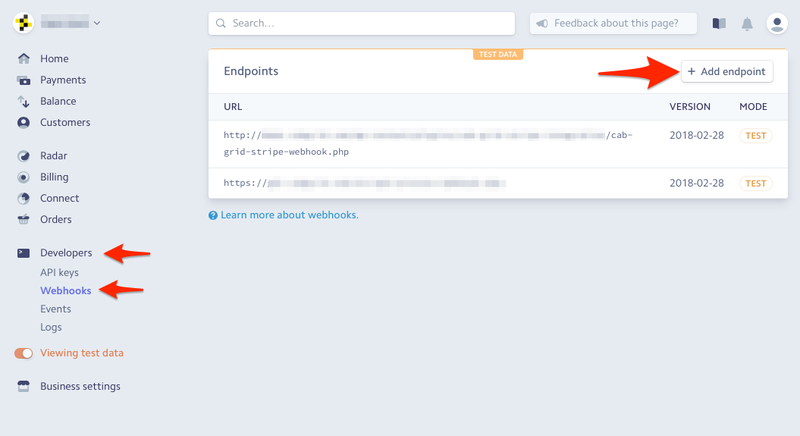 On the Webhooks page, click the “+ Endpoint” button at the top left if the Endpoints table. Click the ‘Add Endpoint‘ button. Note: Some security settings/plugins revoke permissions on WordPress plugin files and folders. 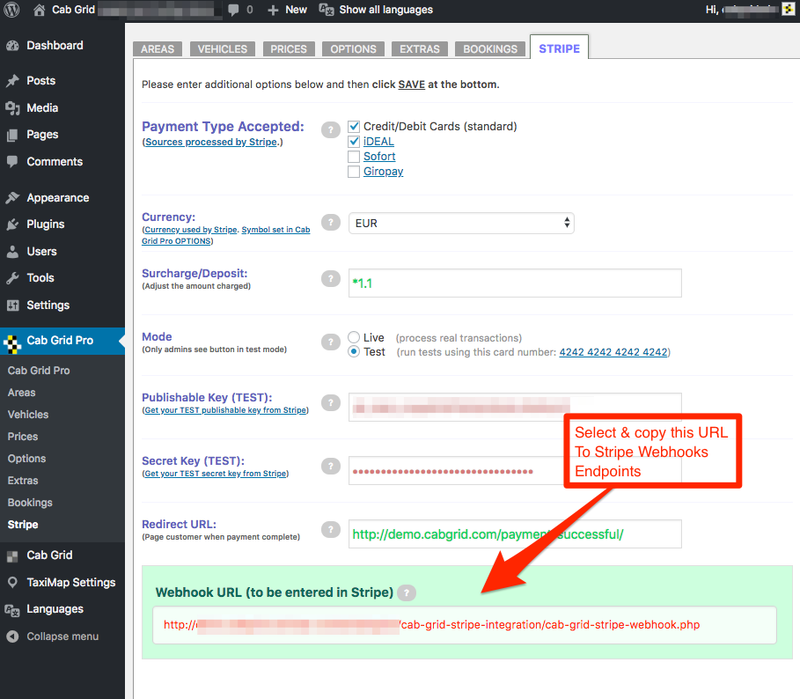 You may need to expressly grant EXECUTE access to the file listed as your Webhook URL for it to be able to properly process payments. This is usually done directly on the web server via FTP or SSH. Consult your host for more info.